A magnificent opening issue which sets the bar as high as it can go. An exploration of character, super powers, cults, and comic book storytelling itself. What Cry Havoc did for supernatural horror, Stronghold is set to do for 'Super Powers' stories. As part of their ‘Read Dangerously’ campaign, AfterShock Comics are releasing a series of new, genre challenging titles. Stronghold #1 is one of them. It has the essence of several familiar stories woven together to form a new and exciting take on the ‘super powered alien trapped on Earth’ trope. With a stellar creative team, Stronghold has the makings of a massive hit. Michael works in insurance and is surrounded with the after effects of death. His waking world is made up of statistics and indifference. However, when he witnesses an accident and the life of a child is in danger, an urge deep within him forces him to take a leap of faith. Somehow he knows that he will survive despite the odds. Elsewhere, from within a secret organisation known as The Stronghold, Michael is under constant surveillance. One of its member’s is about to take a leap of faith of her own but the outcome will threaten the safety of the entire world. There are some very big concepts at play in the first issue of Stronghold. Writer, Phil Hester, does an outstanding job of juggling both the out of the world elements and the grounded characters. 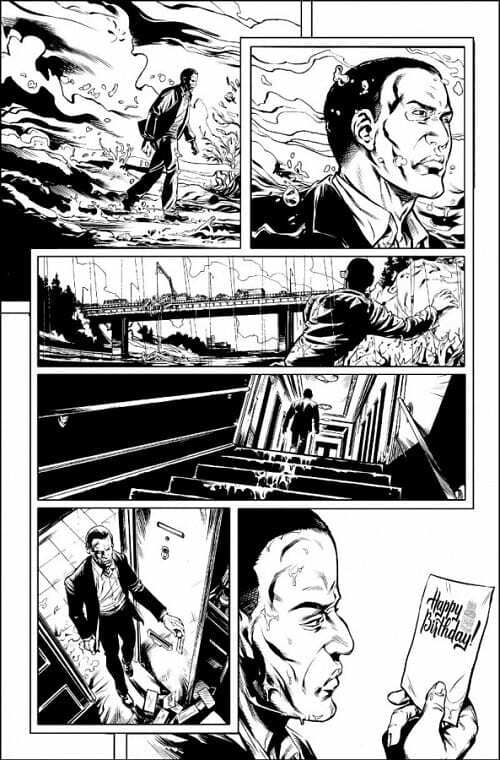 He’s no stranger to big concepts, after all he drew Warren Ellis’ Shipwreck series for AfterShock, and he proves here that he can write them as well as draw them. By concentrating on the two central characters, Hester pulls the reader into the story on a relatable level. Just like Michael, everyone has worked that bland job and wondered what more there can be. And, just like Claire, everyone has taken time out to try to find themselves leading them to question their upbringing. By introducing the reader to the two characters in two separate story-lines which merge in the middle of the comic, Hester is able to give each of the characters their own voice and personality. He is then able to compare and contrast these personalities in the latter half of the comic. This raises questions about who they really are and what they are really capable of. 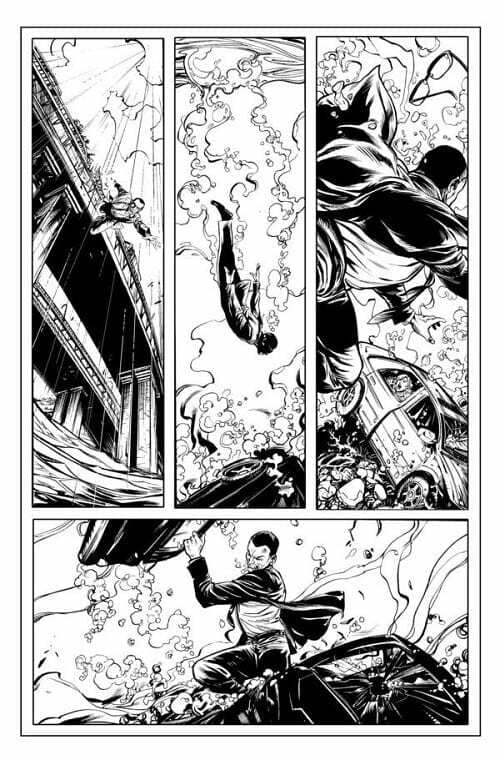 Ryan Kelly is an established artist who, like Hester, is used to working on large concept comics. Cry Havoc was an ingenious supernatural horror which used specific comic book traits to help tell the story. With Saucer Country, and the follow up Saucer State, Kelly was responsible for giving a complex alien conspiracy story a human, relatable face. In Stronghold he brings both of these things together to make sure the reader can traverse the narrative successfully. The characters design makes them instantly recognisable from page to page, even in the shadows or choreographed fight scenes. The emotional performances that the character’s give are also extremely impressive. It is this aspect of the art that really captivates the reader and draws them in to the story. The parallels that Hester wants to draw only work because the characters are depicted as real as possible, emotionally at least. Comics like DC’s Watchmen only have the impact they have because the characters are fully rounded. Kelly brings out the best in Hester’s scripting and dialogue by portraying emotionally real people in spiralling situations. One aspect of the art work that is becoming identifiable with Kelly’s work is the use of gutters. In a number of comics that Kelly has worked on the panel gutters are emphasised, usually by color, so that they have a much greater impact on the reader. In Stronghold the gutters are almost color coded to signify various aspects of the narrative. The colors change mid page to illustrate the move from one location to another. They are even used to highlight the change in emotional reactions between characters. At one point Dee Cunniffe, the colorist, changes the gutter from a warming purple to an ice cold blue as the characters go from being on an awkward date to creeping around in the underground. Throughout the rest of the comic, Cunniffe uses the color as an emotional signifier. Occasionally he picks out a single element or character in a panel and colors them differently to the rest of the panel, drawing the reader to that aspect of the panel. At other times he coats the page in a single colour only picking out subtle shades to create an unsteady atmosphere. The lettering, which often finds itself a stark white against a full colored page, adds an extra layer to the narrative structure. For the most part Simon Bowland’s speech balloons are uniform with the dialogue following suit. This allows the reader to become used to the speech and begin to accept its presence without breaking the illusion of reality that the comic is trying to produce. But then Bowland will alter something, just slightly, to make you aware of its existence. This instantly draws attention to a particular panel or aspect of the narrative, subconsciously forcing you to pay closer attention. 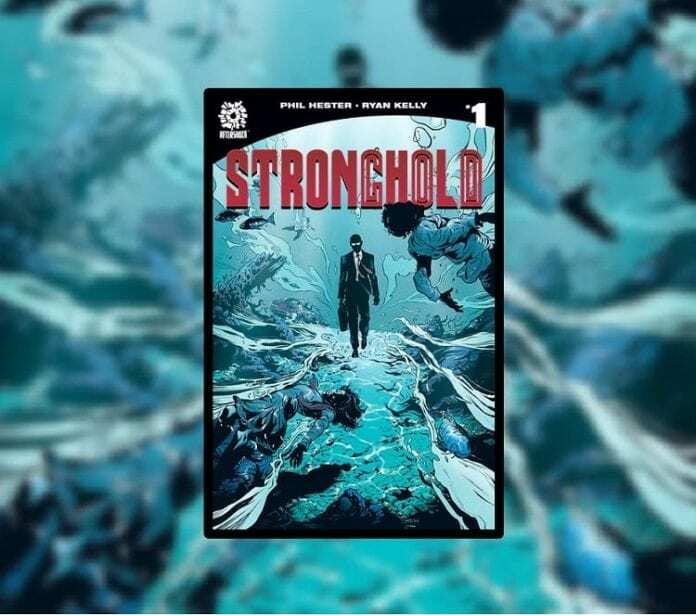 In the same way that Alan Moore and Dave Gibbons questioned what the world would be like if ‘superheroes’ really existed in Watchmen, Stronghold investigates the notion of a how a super powered alien would fit into society. Hester questions how people would react and draws on the cultist nature of the human race. Religion, media and straight forward emotional reactions such as ‘love’ all have a part to play in the wide reaching web of narrative. The creative team superbly handle the complexities of the narrative to produce an exciting page turner of a comic. The visual flair and technical craft give the reader a realistic environment for an out of this world story. Everyone is bringing their A game to this title. This first issue of Stronghold is one of the most interesting and exciting comics to be released so far in 2019. If it continues at this rate it will deservedly be making the ‘best of’ lists at the end of the year.